A month has flown by since I last updated you guys on Chance and he’s grown like a weed! It’s hard to believe he’s still a puppy because he looks like a miniature labrador. Or “Laprador” as I used to call my Gibson. Now any dog would have a hard time following Gibs – he was such a class act, but Chance & I have a bit (read a LOT) of work to do! His little biting fits escalated into some pretty wild behavior – he was launching himself at me, ripping at me, as I tried to fend him off. It started out with some “guarding” behavior centering around the remnants of an old tree stump. He just loves it. See, his little face is just stuffed with grass and wood. There he is in front of the tree – stump. See, he’s looking at me!! It was quite a treasure, apparently. “Be meaner” says the vet. “Let me hear what you sound like when you tell him “no.”” “Chance, NO.” I say. Yeah, not mean enough. “NO CHANCE, NO.” Be meaner, really mean. Any meaner and I’m afraid a neighbor is going to call 911! Chance and I danced around the edges of frustration, rage and exhaustion. For about 10 days that seemed like a life-time. I knew there could be some issues with bonding & development from his early history and the treatment he underwent with his hip. But progress is being made with a little regression now and then. A lot of labrador pups go through that stage, usually a little younger, I think. They’re kind of known for it, but once they grow out of it and settle down, after about 12 years or so, they’re beautiful dogs, lol! Chance barking at his ball, thinking about going in! Look at that tongue!! When he spotted my neighbor’s collection of critters, he ran up to the deer, gave it a quick sniff, backed up and “play-bowed.” Then cocked his head and gave it a bark or two. Just to tell it what is what. And he skittered away from the watering can. It needed a wide berth. Quite suspicious it was. When he goes down the stairs at my house, which are long and narrow he had to be really encouraged. Scary stuff, that, and a bark or two put them in line. He’ll only walk down right next to me hugging the wall, though. And it has to be the wall on the right side. Chance has turned into quite the fetcher. He tilts his head when you talk to him. We tried out one of those “new fangled” gentle leaders – the one that goes around the snout. Oh, the horror! Poor Chance just couldn’t submit to the indignity, even though it was introduced just a minute or two at a time, with lots of praise and treats. After a walk with my neighbor (while he scuffled along the ground trying to scrape it off) as I told her how much better he was getting at this, she called and asked me Chance’s measurements. Auntie got him the Gentle Leader Harness. It’s a small miracle, guys! He still dog paddles now and then but for the most part he’s pretty smooth! There were waves! Not big ones, but waves, and it took a little time and a quite a few barks to subdue them to his satisfaction. And in he went and scooped up the ball like he was bred for it. Which he was, lol! 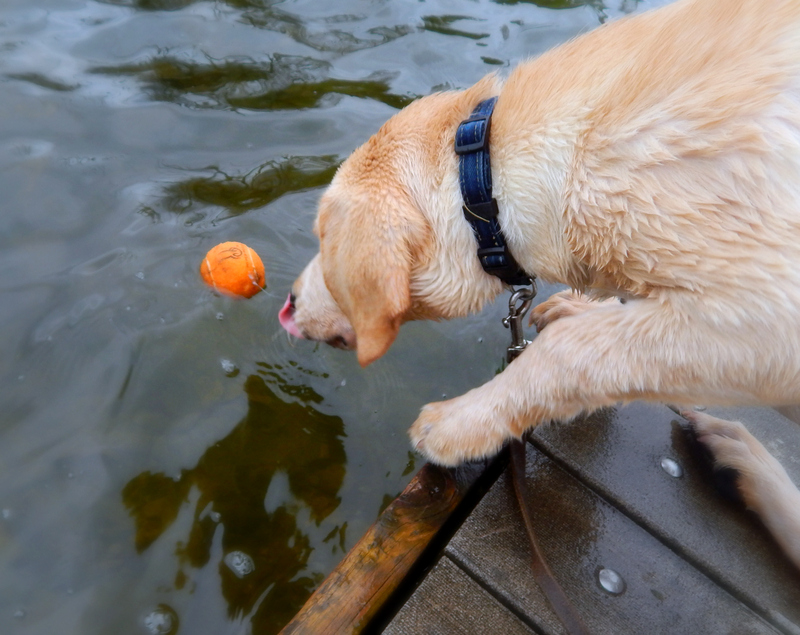 Then he discovered lake foam. Oh, that was fun, poor ball forgotten. That lake foam didn’t pay much more attention to his barks than the waves did. Yeah, coz it’s so much easier to climb up the dock than to walk about five feet to the shore. It’s sad to say goodbye to summer. I thought after all our heat waves and heat domes that fall would sneak in ever so slowly. I don’t know how many more times Chance will get to swim, especially as we’re in South Dakota so much. But at the same time, I can’t wait to see what Chance thinks about snow! Oh, did I utter that word. I did, didn’t I!! Hope you liked hearing all about Chance and that I haven’t rambled on too much. But it’s time to really ramble on and say good-night! What most of my photos of Chance look like! He’s so cute!!! And I’m afraid Bob is also a lover of goose poo….we have a lot of Canadian geese around here, and a LOT of goose poo!!!!! See, some things are universal!! You know we almost lost our native geese here in the US. The ones we have, from what I understand were built up from a surviving flock of about 20 near Rochester, Mn. Of course now we have too many, but flocks are culled by the state and processed and go to some food shelves from what I understand. Oh geez yes sorry to bring that up but at least they are going to a very good cause. Chance just now figured out how to open up my closet door by himself. Oh no. Oh no!!!! How funny, Bob never did that. He had his own pranks though…!! It’s amazing to think he’ll be 3 at the end of this month..
You are so right, and puppyhood is soooo fleeting! What an adventure you’re on with that guy Mollie!! Sounds like you’re loving it! Thanks for all the fun photos!! hugs! I’m glad you like them I was afraid it was getting a little carried away. lol!! Well, he really is a cutie…MOST of the time!! He is so adorable! Labs can get really big and they are such cuddly creatures. Sir Chance a Lot – pure genius!! My son can come up with some good ones. I really think it’s so much about consistency and making sure they have enough exercise and stimulation so I’m just going to have to keep working on it. My problem is I’m so old LOL. I forgot how much work puppies are! Hahahaha I am sure you will be fine. I am glad Chance has you. Yes, puppies are like babies….Lol, puppies are babies :-):-) 😉 Have a good week. Thanks Nancy for your kind words of encouragement. I do think labs have gotten quite a bit crazier than they used to be. When Liz worked at the Humane Society she used to mention it now and then. Of course she’s my younger sister LOL so I didn’t feel it necessary to listen to her haha. Seriously I love labs and of course I love golden retrievers 2 but honestly out of the two breeds I think labs are smarter and they are wash and wear LOL. We will be hanging in there. I love the puppy stage but I’m also very happy once it’s over!! And oh you are so right about mistakes, we have but one life, if we don’t make mistakes we don’t learn, life is not about perceived perfection it’s about making the most of every single moment. Have a great day, and I am just a little envious of snow, we never get any here!